Decorate your door or wall with a beautiful yarn wreath. Change yarn colors every season and then have fun decorating with florals, ribbons, charms, fabric and more. Our secret: twisted yarn. There's no knitting or crocheting. Click image to the right for a larger image. You will need 7 oz. of each color of 4-ply acrylic knitting yarn you wish to use, and a 14" wire ring. This will give you more than enough yarn to make each color of cord. 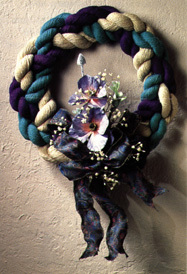 In total, a three-color twisted yarn wreath requires 21 oz. of 4-ply yarn. The twisted yarn cords used to make your wreath will each measure 45" in length when finished. To make a twisted yarn cord that is 45" long you will need to begin with loops that are 135" long. Loop the yarn around two fixed points such as door knobs or chair spindles. Here's how. Make 40 loops around 2 fixed points, 135" apart. Wrap one of the loose strands of yarn around the 40 loops to hold yarn together and tie the two loose strands together. 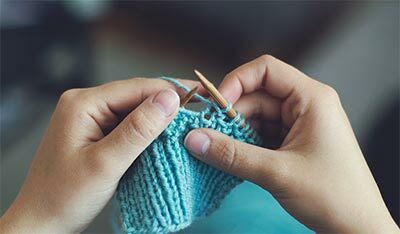 Slip a plastic crochet hook through the end of the 40 loops. Pull the length of yarn taut and begin twisting until very firm. Keeping the now-twisted yarn taut, find the mid-point and fold in half, bringing the opposite ends together. On longer lengths, when working by yourself, you will need to bend the mid-point around an object that allows you to easily slip off the finished cord. The finished twisted yarn cord will twist on itself. All you need to do is hold ends securely. You may want to guide the cord with your hands as it is twisting. 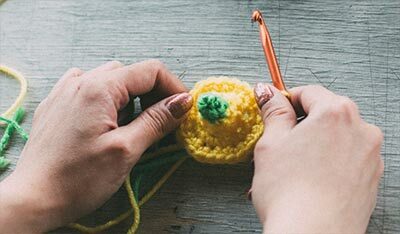 Using a crochet hook, pull one of the loose strands through all loops of the other end. Tie the two strands together. Join the three cords at one end. Braid the three yarn cords together. Secure ends and join beginning to end. Tie with double strands of yarn to wire ring.